No news. 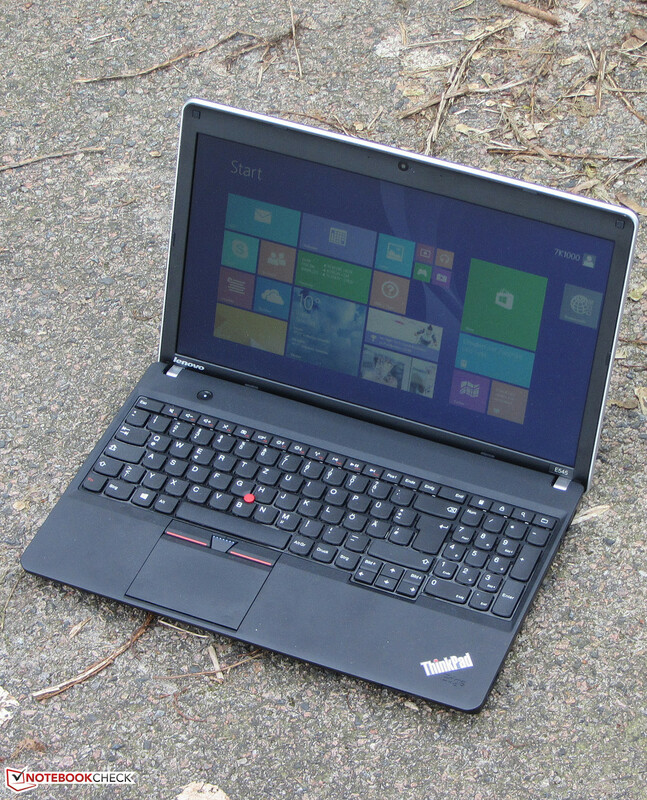 The ThinkPad Edge E545 wants to be a device for private and business use. Apart from a big storage capacity, the notebook features a matte display, an AMD quad-core processor, and a good keyboard. These are all signs of an attractive device for work. Our review will reveal whether the device really is a well-made notebook. 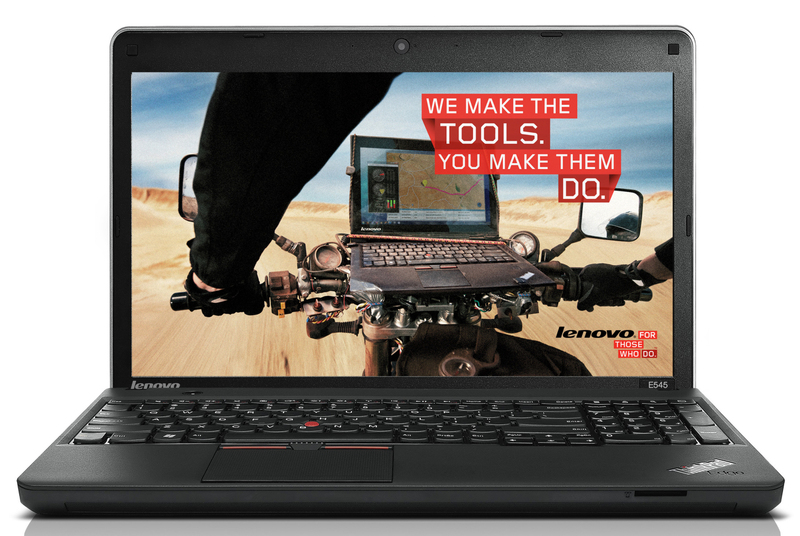 Lenovo wants to offer ThinkPad quality for low prices with the ThinkPad Edge series. This appears to be attractive for customers, since this series has already been on the market for several years and is brought technically up to date continually. 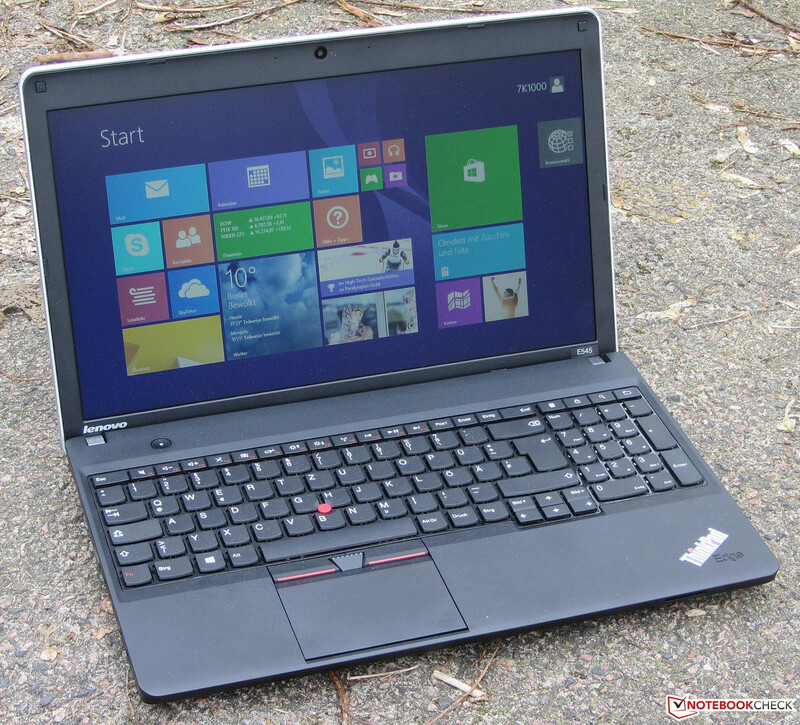 With the ThinkPad Edge E545, we received a new model with AMD hardware. Our review will reveal whether it performs as similarly well as its predecessors and sister models. We compare the notebook to the following competitors: the HP ProBook 450 (Core i7-4702MQ, HD Graphics 4600) and the Fujitsu Lifebook A544 (Core i5-4200M, HD Graphics 4600). 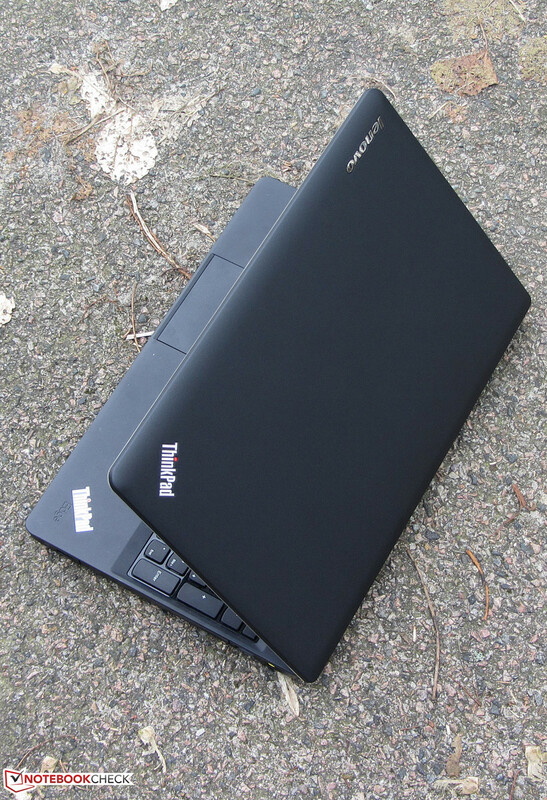 The ThinkPad Edge E545 is technically identical with its predecessors. So, we will not cover case, connectivity, input devices and speakers here. 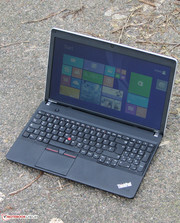 This information is available in our review of the ThinkPad Edge E535. 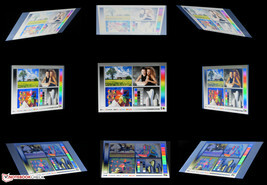 The matte HD display (1366x768 pixels) has an average brightness of 241 cd/m² and, so, ranks in the upper mid-range. However, contrast (173:1) and black value (1.46 cd/m²) are awfully low, which is no longer acceptable nowadays. 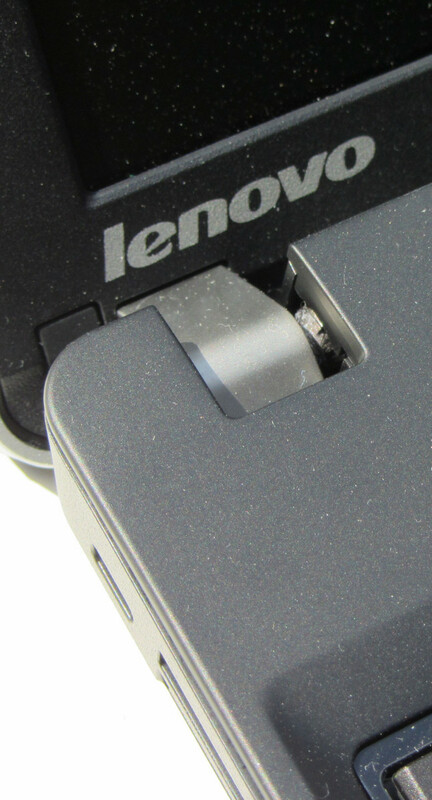 Lenovo has to improve here. 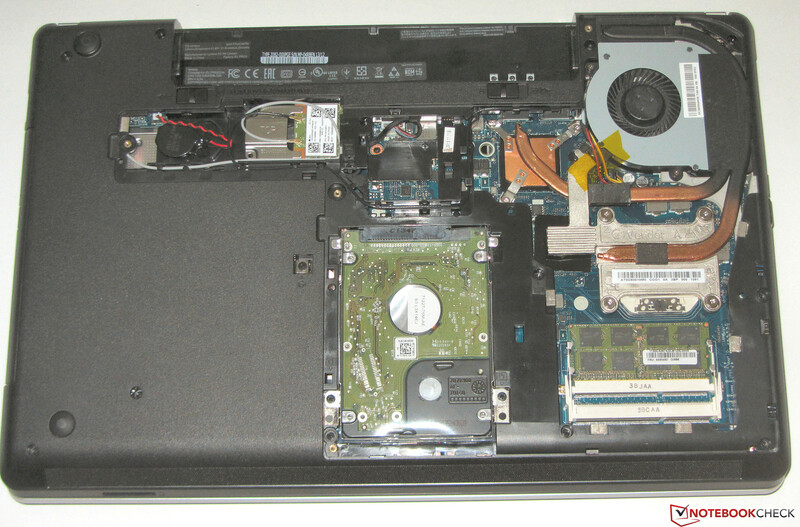 The displays of the ProBook and the Lifebook perform similarly poor. In factory state, the average DeltaE 2000 deviation of the display is about 6. So, the display performs significantly better than most of the displays measured by us. Several colors even reach the target range (DeltaE smaller than 3). If anything, the display is minimally bluish. The display cannot cover either AdobeRGB or sRGB. The coverage is about 63% (sRGB) and 46.3% (AdobeRGB). Outdoor usage is indeed possible, but too bright environments should be avoided. 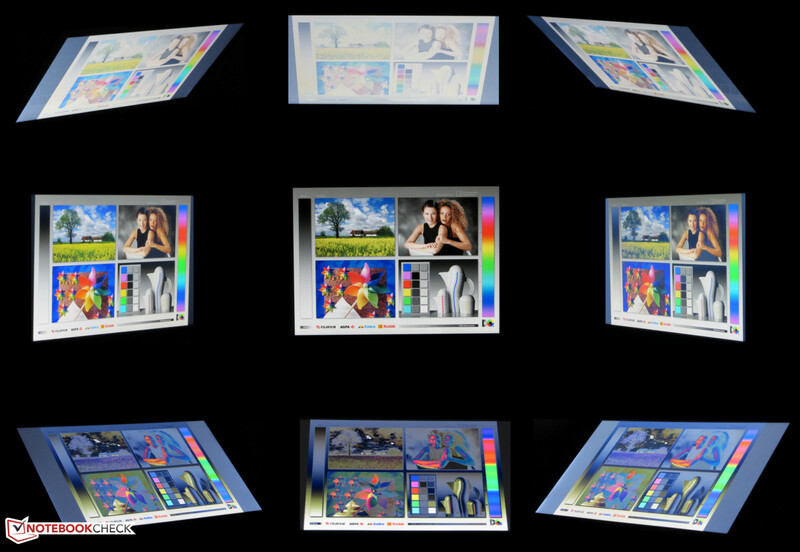 The viewing angles are as usual: The picture quickly distorts in vertical direction while the viewing angle stability is significantly better in horizontal direction. Several people can look at the screen simultaneously. The display of the Edge E535 performed even worse. The various models of the ThinkPad Edge E545 series are inexpensive notebooks for private and business use. They deliver sufficient performance for everyday tasks. Our test model costs about 540 Euros (~$751). HP also offers other configurations. If you need more CPU performance, you can select notebooks of the ThinkPad Edge E540 series, which are equipped with Haswell processors from Intel. 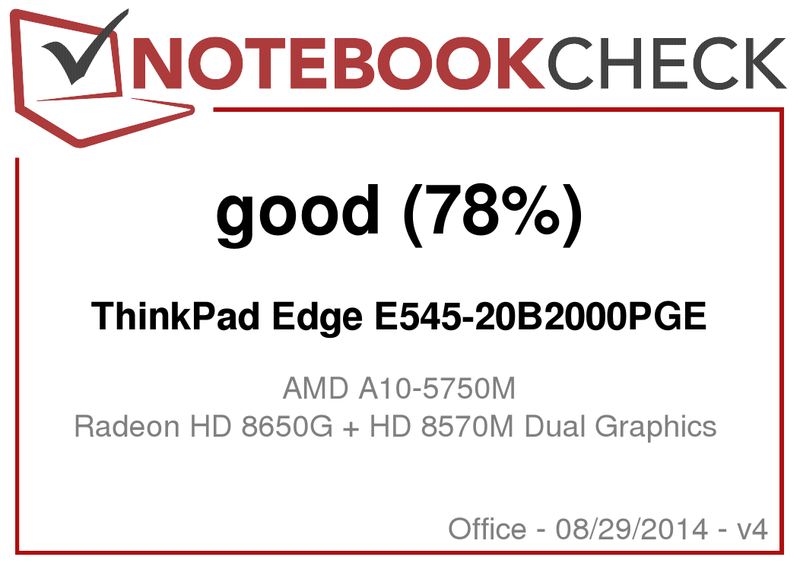 With the ThinkPad Edge E540 20C60041 (Core i3-4000M, HD Graphics 4600), we have already reviewed a representative of this series. Lenovo equipped the ThinkPad Edge under review with an A10-5750M APU from AMD, which is based on the Richland architecture. The CPU part of the APU consists of a quad-core processor with a base clock of 2.5 GHz. Turbo can increase the clock rate to up to 3.5 GHz (AMD Turbo Core). AMD specifies a TDP of 35 Watt for this APU. The processor continuously clocks at 3.2 GHz in the single thread tests of the Cinebench benchmark. Sometimes the clock rate of one of the cores gets accelerated to 3.5 GHz. During the multi-thread tests the four cores work with a clock rate between 2.5 and 2.8 GHz. The mentioned values apply to mains operation. On battery the processor continuously clocks at 2.5 GHz. The ThinkPad Edge cannot keep up with the Lifebook and the ProBook since both notebooks feature significantly more powerful processors. The system works smoothly without issues. The PCMark 7 result is definitely good. 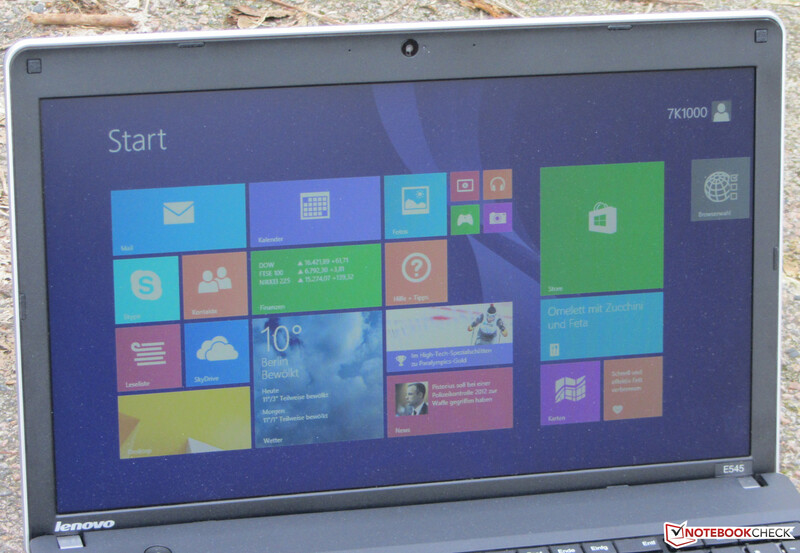 However, it cannot reach the value of the ProBook, whose much faster CPU is noticeable here. We did not run this test on the Lifebook. 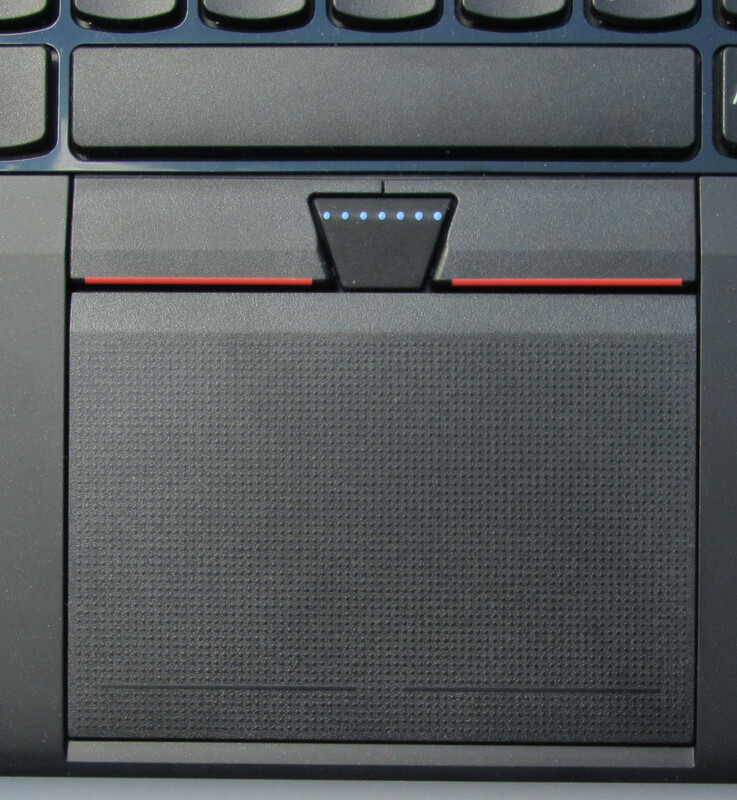 Lenovo equipped the ThinkPad Edge with a hard drive from Western Digital with a capacity of 1 TB and a revolution speed of 5400 rpm. CrystalDiskMark reports a read rate of 84.8 MB/s and HD Tune displays an average transfer rate of 81 MB/s. 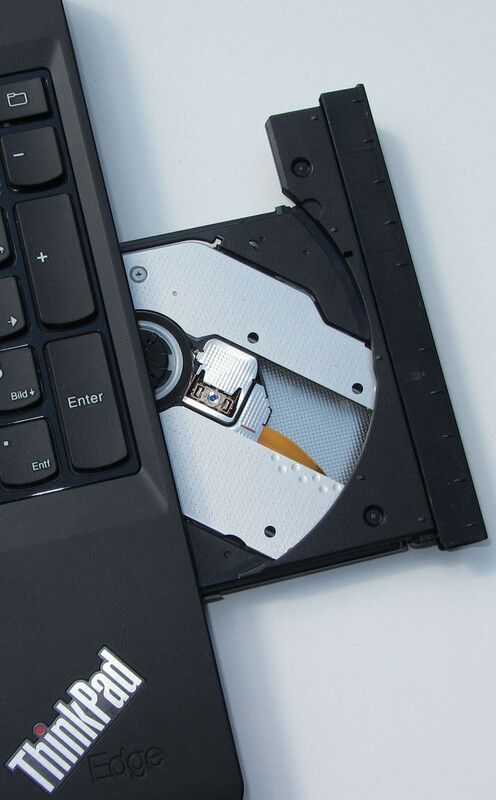 The recorded transfer rates are largely in the normal range for a 5400 rpm hard drive. But, the 4k write results are above-average. The ThinkPad Edge features an AMD dual graphics solution consisting of the integrated Radeon HD 8650G graphics core and the dedicated Radeon HD 8570M GPU. Both graphics chips support at least DirectX 11. The GPUs work in a so-called Crossfire connection, i.e. both cores can work on the calculation of the displayed image. During everyday tasks and on battery only the integrated GPU is used by default. It is also possible to use the dual graphics solution here. The driver menu allows the user to select whether the dual graphics solution is used for each application. The dual graphics solution proved to perform overall better than the integrated GPUs of the competition - according to the results of the 3DMark 2011 benchmark. 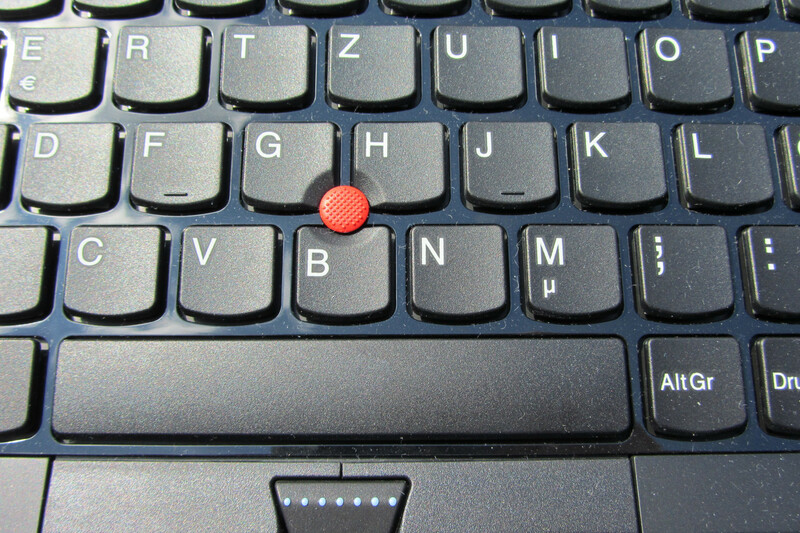 The ThinkPad Edge can run the majority of games smoothly in low to medium resolution. The user has to be content with low to medium quality settings. In current games like Thief and Call of Duty: Ghosts the notebook hardly achieves playable frame rates. But, this might change in the future through better driver support. 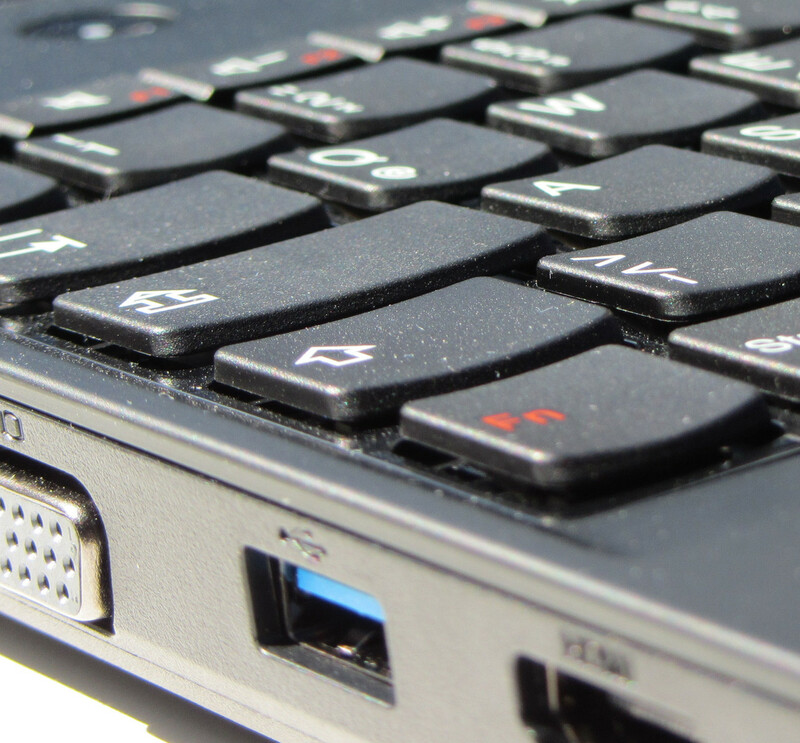 If more gaming performance is desired, the Dell Latitude 3540 would be an alternative. It also focuses on private and business users and some models come with a Radeon HD 8850M graphics core. But, it is significantly more expensive than the ThinkPad Edge with a price of about 700 Euros (~$973). A notebook for work should work quietly or even silently regardless of the load. While idle, only the quiet rustling of the fan is audible. The fan gets hardly louder under full load. None of the three computers gets especially warm while idle. They only get moderately warmer during the stress test. The temperature only rises more at the measurement points close to the fans. 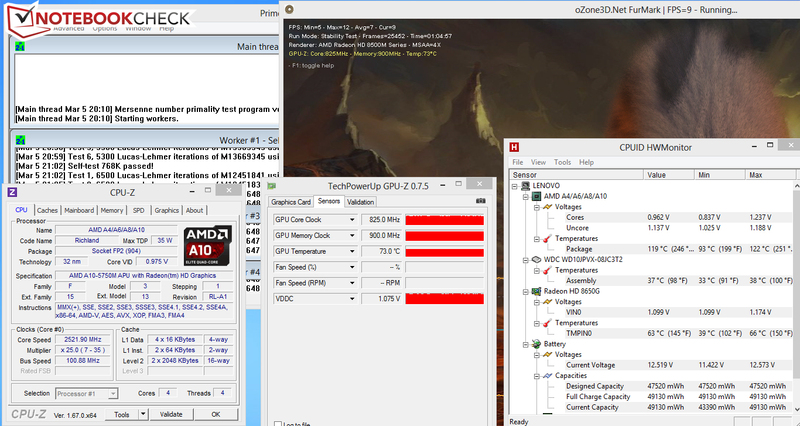 During the stress test (Prime95 and Furmark run for at least one hour) the CPU mostly clocks at 2.5 GHz. It increases (2.8 GHz) and falls (2.1 GHz) repeatedly. On battery the processor mostly runs with a clock rate of 900 MHz. It increases to 2.5 to 3.2 GHz repeatedly. Both graphics cores work in the same way in mains operation and on battery. While the dedicated graphics core clocks between 750 and 825 MHz, the integrated GPU's clock rate is 354 MHz and repeatedly increases to up to 720 MHz. Although the clock rate of the CPU falls to 900 MHz every now and then, this does not occur during everyday tasks. If the notebook runs on battery in daily life, the CPU continuously clocks at 2.5 GHz. As a result the Cinebench results are slightly worse on battery than in mains operation (Cinebench R11.5: Single: 0.63, Multi: 1.98). 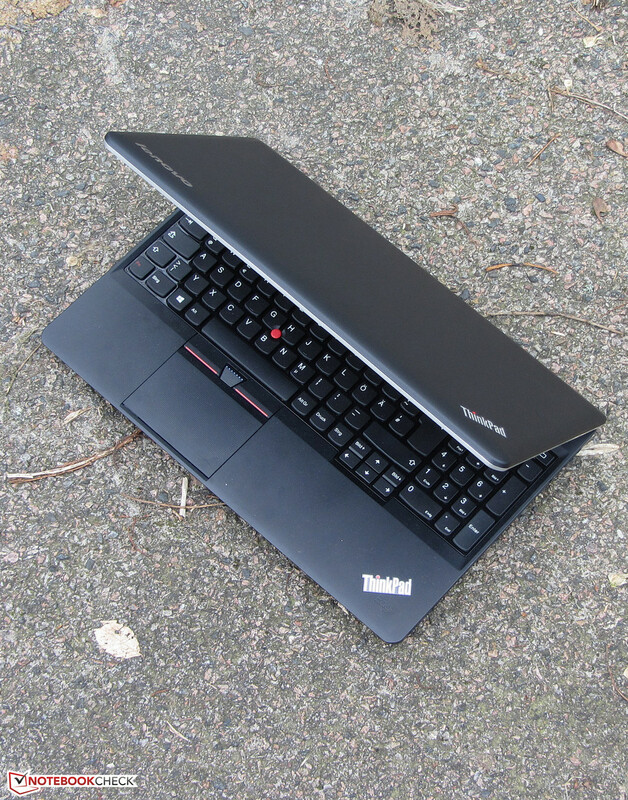 With 10.9 to 13.4 Watt, the ThinkPad Edge requires significantly more energy than the ProBook (6.3 to 8.8 Watt) and the Lifebook (5.4 to 8.2 Watt) while idle. The same is true for medium load (3DMark06) and full load (stress test: Prime95 and Furmark). The power consumption is between 44.7 and 61.3 Watt here. This is not surprising, since the Thinkpad Edge features a dedicated GPU besides the integrated one. While idle the battery life of the ThinkPad Edge is 6:31 h. The ProBook's (9:39 h) is significantly longer. We did not run this test on the Lifebook. The idle scenario is tested with the Battery Eater Reader's test with minimum display brightness, energy saving profile and disabled radio modules. 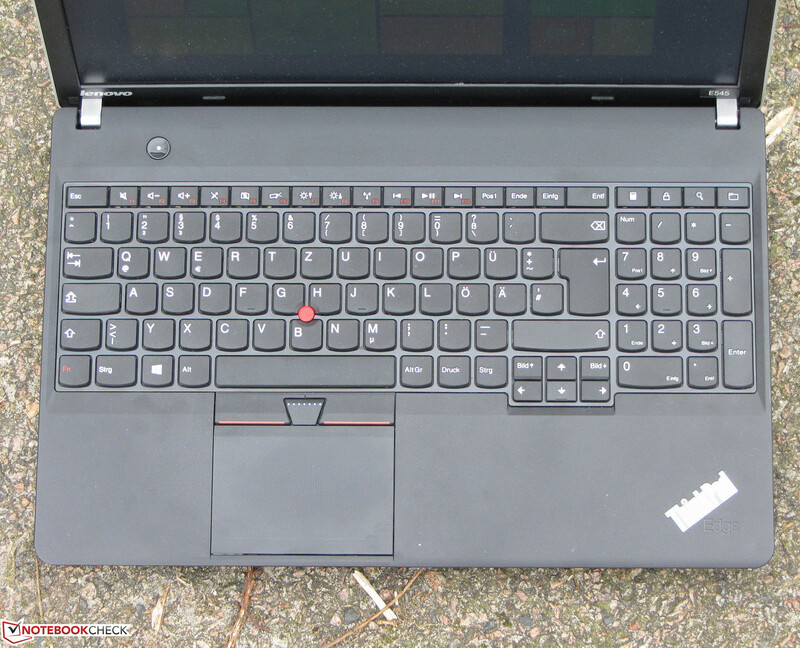 Under load the ThinkPad Edge shuts down after 1:10 h. The ProBook's (0:59 h) battery is empty earlier. Again, we did not run this test on the Lifebook. The battery life under load is tested with the Battery Eater Classic test with maximum display brightness, profile "maximum performance" and enabled radio modules. Our realistic WLAN test automatically loads websites in 40 second intervals. The energy saving profile is active and the display brightness is set to about 150 cd/m². The ThinkPad Edge achieves a battery life of 4:16 h. The ProBook's (4:48 h) and especially the Lifebook's (6:50 h) times are longer. DVD playback ends after 2:35 h on the ThinkPad. Again the ProBook (3:10 h) achieves a better value. We skipped this test on the Lifebook. The DVD test is run with energy saving profile (or higher, if the DVD does not play smoothly), maximum display brightness and disabled radio modules. 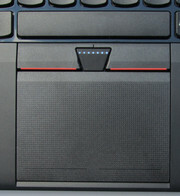 The Lenovo ThinkPad Edge E545. The Lenovo ThinkPad Edge E545 delivers a good system performance and is also able to run many computer games. In addition, it has a big storage capacity and comes up with a good battery life. Access to the inside is possible without problems. 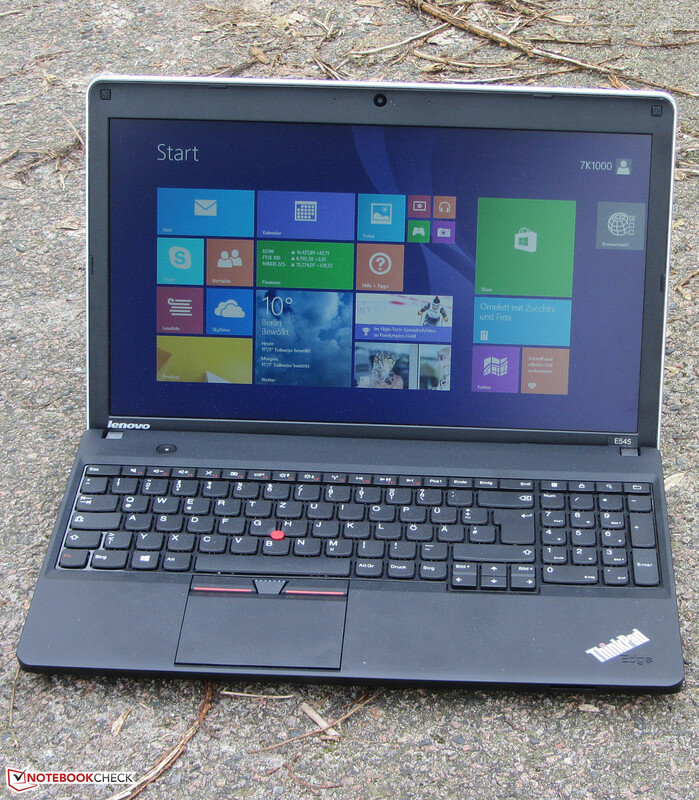 Like all other ThinkPad Edge models we reviewed so far, the Edge E545 is also equipped with good input devices. 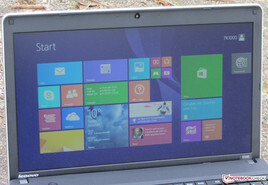 Alike in the Edge E535, the biggest weakness of the notebook is the display. Black value and contrast are extremely bad. A warranty of only 12 months is no longer appropriate, either. 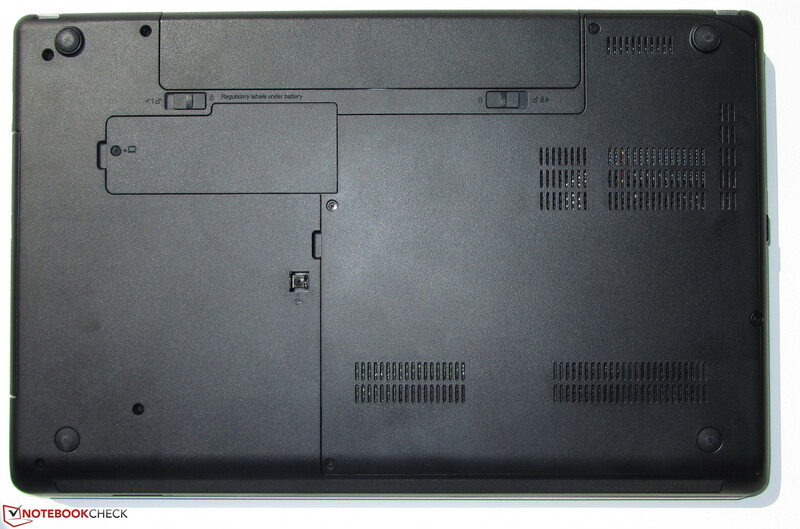 Basically we could reuse the text of the E535's verdict for the ThinkPad Edge E545 since both devices are hardly different. They have the same strengths and weaknesses. The only one real difference: More powerful CPUs and GPUs are available for the Edge E545 models. If you generally like the E535 and do not have big demands for CPU performance, you could also select the cheaper predecessor. 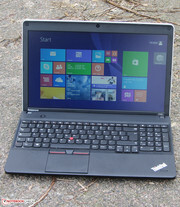 For example, the ThinkPad Edge E535 NZRFPGE model with A6-4400M APU, 4 GB of RAM and 320 GB hard drive is currently available for about 320 Euros (~$445) - without Windows OS. The HP ProBook 450 and the Fujitsu Lifebook A544 score points with their significantly stronger processors. A better battery life is another advantage of the Lifebook. The good input devices and the low system noise. Definitely a display with a higher contrast. It is hard to believe that Lenovo still dares to offer a notebook with such a low-contrast screen nowadays. Fujitsu Lifebook A544, HP ProBook 450, HP ProBook 455, Lenovo ThinkPad Edge E540, Acer TravelMate P255-M, Dell Latitude 3540.